Marco Melandri has stormed to his second pole position of the season and the first-ever at San Juan Villicum Circuit in Argentina. After a session-long battle with Kawasaki Racing’s Jonathan Rea, the Ducati rider was able set a fastest lap time of 1’39.012 in the final four minutes of the session – putting him 0.440 seconds clear of the rest of the field and bettering his own previous fastest time. With grip levels seemingly reduced due to the newly laid tarmac, riders were forced to adhere to a narrow racing line illustrated by a distinctive darker trail of rubber, snaking its way around the 4.276-mile track. Rea was unable to put in a final challenge on his last lap after running off-line on the first corner and onto the slippery untouched asphalt. This was after a couple of other moments earlier in the proceedings. Completing the front row was the first of the Milwaukee Aprilias ridden by Eugene Laverty, who managed a time just over half a second slower than the pole man. He was followed home by the second factory Kawasaki of Tom Sykes, who was able to bag fourth spot with a 1’39.558 after being forced to go through the first qualifying session alongside Pata Yamaha’s Michael van der Mark, who eventually ended up eleventh fastest. This was only after a late charge by Honda Racing’s Jake Gagne fell slightly short of a slot in Superpole two, after losing too much time in the final sector of his fastest lap. Lining up behind Sykes and completing the second row for this evening’s first race are Xavi Fores and Britain’s Alex Lowes, with all six fastest riders dipping into the 1’39s in the process. 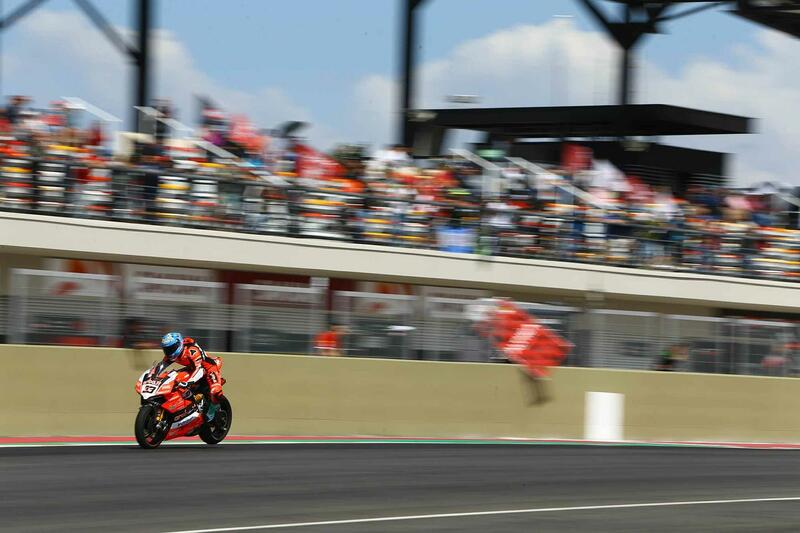 The second Aruba.it Racing Ducati of Chaz Davies was over a second slower than teammate Melandri with a lap time of 1’40.094, before being forced to retire with a technical issue in the latter stages of the second session. 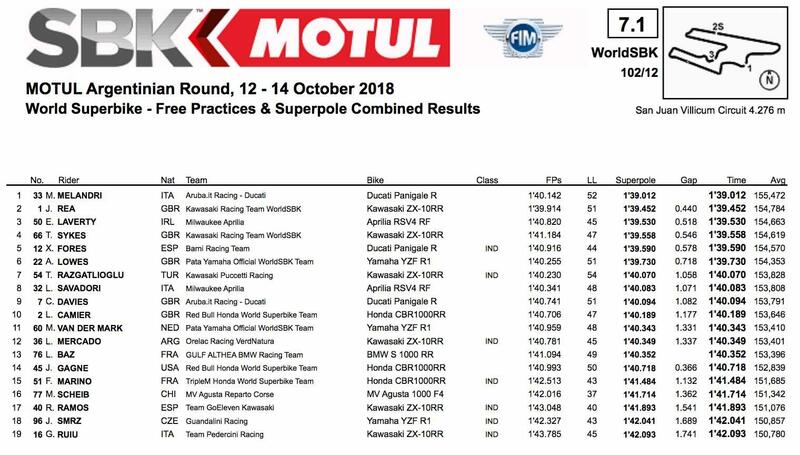 Taking the final spot in qualifying two and twelfth on the grid was local hero Leandro Mercado aboard his Kawasaki ZX-10RR with a time of 1’40.349, putting him 1.337 seconds back on Melandri’s best lap.